Wed 14th Jim drove Ian C., Gareth and me to Little Budworth, where we met up with Simon, the ranger responsible for the site. The task he had lined up for us was a continuation of the work done almost exactly a year ago. 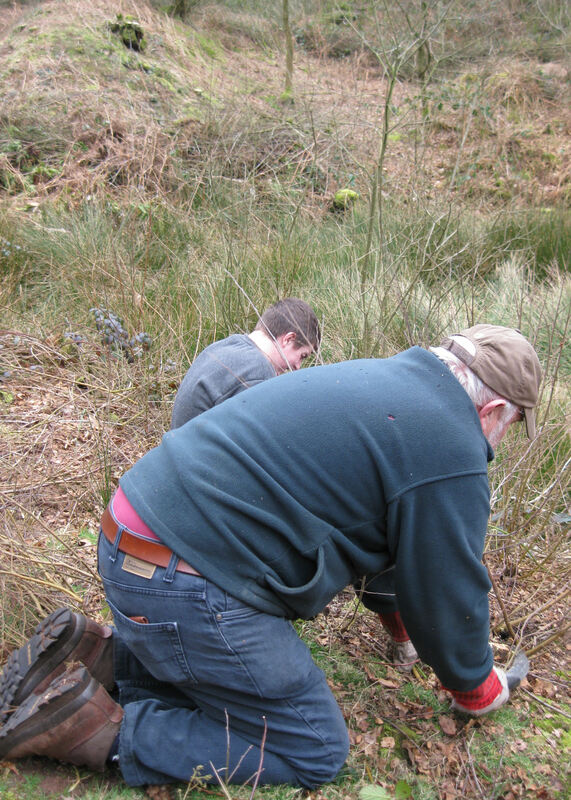 We had cleared scrub, mostly willow from the area around the pond. Simon wanted us to remove the regrowth and top the old stumps so that he could treat with herbicide. He provided us with vicious looking saws, appropriately named Samurai. We scrambled over the bank trying to avoid the trip hazards, brambles and tree stumps. We spent most of our time on our knees and were more than ready to transfer our weight to our bottoms at lunchtime. Simon found us a dry sheltered bank where we could sit with our buttie boxes and flasks. Then it was back to more of the same. By three o’clock we’d reached the end and began to tidy up brash and tools. We bid Simon farewell and returned to Marbury for a cup of tea. Thur 15th Amanda gave Elna and me sprays of mistletoe and a set of instructions to take to the orchard. 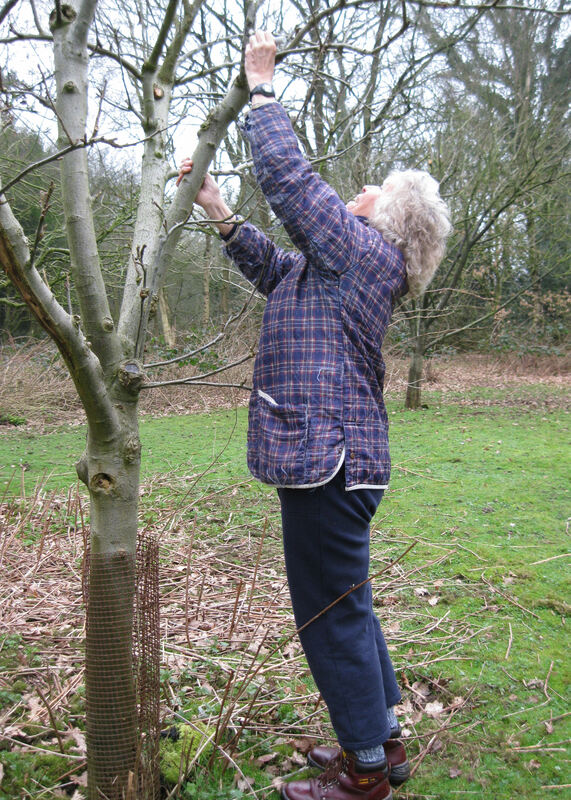 It was a misty morning and cold for aou fingers as we squidged the seeds out of the berries and tried to stick them onto apple tree branches of a specified diameter (2 to 6cm). The stickiness meant that they stuck to our fingers as well. The mistle thrushes must have quite a job wiping the seeds from their beaks, but do they select branches of the correct diameter? For a change this was a reaching up job rather than a bending down one. After about an hour we went in search of some hot water to wash and warm our hands. We joined Jim at the burning site to help him put the last of the old fencing onto his blazing bonfire and got warm. Jim and I returned to rake the embers together after lunch and then we drove to Carey Park for a bit of litter-picking. We filled two sacks with rubbish strewn beside the tracks, which we left for Dave to take back to the yard. 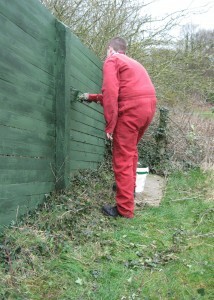 Wed 21st The alternative to fencing was painting. I persuaded Gareth to join me to do the ladder work. We parked in Marbury Lane and carried the paint etc up the steps to Haydn’s Pool. 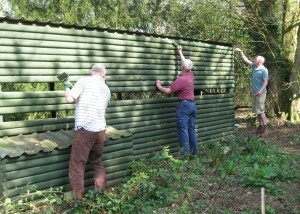 First we had to strip away the ivy that had established itself on the hide. We began painting after brushing away a few cobwebs. Gareth had the protection of pink overalls. But the only other set would have given me ten inch turn-ups. Even though it was warm I took the precaution of wearing my old waterproof and a hat. Nevertheless I got splashed with paint on my neck and before I went to bed Jim checked that I’d washed behind my ears. 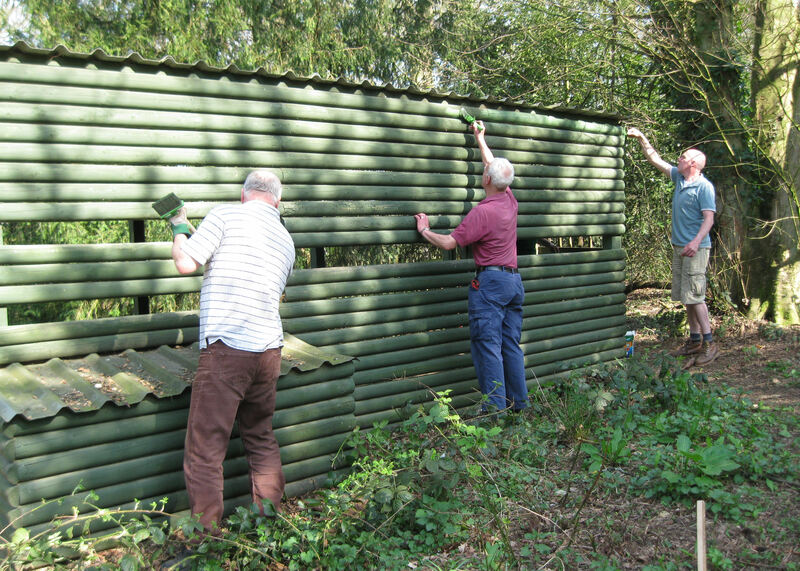 Jim joined in the fun after lunch and between us we almost painted the inside of the hide and left warning tape and ‘Wet Paint’ signs to deter all but the keenest birdwatchers. Thur 22nd Susan joined the painting gang. We carried all our painting gear up the steps to Haydn’s Pool and finished off yesterday’s job. Susan looked most professional in her bright yellow overalls. Sorry, no photo. We reached the stage when there was mostly just ladder work, so Susan and I took a can of paint to the TATA Hide on the far side of Haydn’s Pool and started on that. By lunchtime we’d painted about a quarter of it, but Jim and Gareth helped us to finish the inside in the afternoon. It became quite warm and we began shedding layers of clothing. I abandoned my old waterproof and I hope the paint washes out just as Dave has promised. My finger nails will need a bit of attention to get rid of the green. Wed 28th Groups of volunteers were engaged on litter-picking, painting bird hides and getting the pond-dipping station ready for use by groups of children. 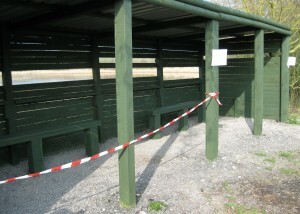 Thur 29th Elna and I had a pleasant walk to the mere Hide and then the Woodland Hide to remove the ‘Wet Paint’ signs and warning tape. Inevitably there was litter to collect, even though it had been done yesterday. Back in the yard we collected brooms and swept out The Lodge, where stones had carried in from the drainage channels.